This is a guided tour through The Dark Would poetry/text art exhibition at Summerhall in Edinburgh. It is narrated by Phil, who curated the show and includes interviews with contributors Simon Patterson, Sarah Sanders and Steve Emmerson. We thought that followers of this blog who can't make it up to Edinburgh might enjoy the chance to take a vimeo walk around, because it includes a large piece from arthur+martha. Discussion about the piece, a quilt for when you are homeless, is 8 minutes in, towards the end of this short documentary. The arthur+martha artwork a quilt for when you are homeless is the central piece in an exhibition that gathers world-leading artists and poets. 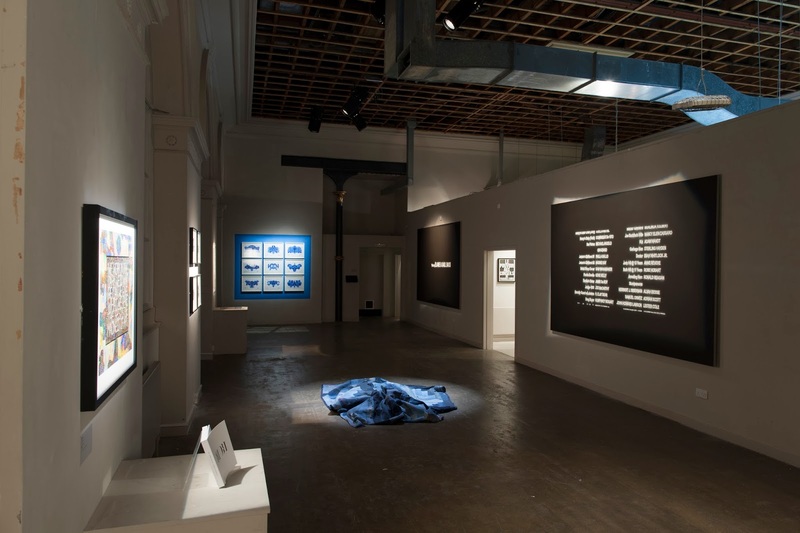 The quilt, stitched by homeless people, is directly juxtaposed with works by Richard Wentworth, Jenny Holzer, Simon Patterson, Mike Landy, Caroline Bergvall, Ian Hamilton Finlay, Alec Finlay, Guy Debord, Pierre Albert-Birot, Joseph Beuys and Tony Lopez, all of whom are internationally significant makers of art/poetry. Putting a community artwork into this context raises questions about the value and ownership of art, and about who we listen to, who we trust. The quilt documents difficult lives with a combination of emotional power and restraint. If you take away the issue of price tags (some of the works in the exhibition were worth many thousands of ££££) and look at this as an object, next to other similar objects it makes its point with tremendous clarity: if you are homeless you feel the cold, both physically and symbolically. You are shut out of shelter and out of dialogue too. I placed the piece on the floor, with the shape of a body underneath it, because I wanted visitors to picture it as a person lost within a dark forest of possibilities: of the violence, madness, joy, love, revolution and despair depicted by the other artworks. Putting the work on the ground felt contrary to my instinct to elevate and celebrate this piece. But it also made a sharp point - many people are excluded from social interplay, from art, poetry, shelter, food, money - and yet perhaps they are the ones who should be listened to most carefully of all, because they see what everyone else cannot. The Dark Would exhibition is at Summerhall in Edinburgh until 24 January. Admission 11-6pm is free to all. Thanks to Peter Dibdin and Summerhall for permission to use the exhibition photograph. This project has been assisted by the NALD as part of a large multi-voice poem, Albion.